You hit your 18th birthday and are excited about voting on November 6th... now what?? If you missed our First Time Voter program, don't fear! Find Your Voter Information, including your polling location, ballots for upcoming elections and your elected officials. FAFSA Completion Workshop October 18th! Hello College-bound Teens (and your parents)! The 2019-2020 FAFSA application was opened on October 1st! If the form and its questions are leaving you a little confused, please consider registering for the FAFSA Completion Workshop. The FAFSA Completion Workshop will be held October 18th from 6-8pm in the Cardinal Room. A representative from ISAC will be available to provide in-person help with filling out the form. Income earned from work and business, child support paid or received, and any other untaxed income. If you have them, refer to the W-2 Forms or Federal Income Tax Return IRS 1040, 1040A or 1040EZ. Savings, certificates of deposit, stock options, bonds, 529 plans and other college savings programs; and investment, real estate, business and farm. On Friday, August 10th, we celebrated teen filmmakers at the 12th annual Teen Film Fest. We had a record number of entries this year, all thanks to the amazing teens making amazing movies! Check out the photos from the Red Carpet, Teen Film Fest, and amazing After Party! Watch all the films here and see the winning films below! Getting silly with all of our filmmakers! The Hub got all decked out for the After Party. Our amazing TAB volunteers tended our MOCKtail bar. • I like a good video game, but I’m usually a few years behind on those. What I really love are tabletop games, especially Dungeons & Dragons. Once you get me blabbering about the custom campaign I’m DMing for friends, it’s hard to get me to shut up about it. • In addition to loving books, I’m also a huge nerd for movies and music. I love talking about the biggest blockbuster or indie band, and always want to hear about your new discoveries. • I love traveling and eating weird food. From black tea ice cream to scotch eggs to bone marrow to basil donuts, I want to go to all of the places and eat all of the things. It's summer time, which can only mean one thing: Summer Reading in the Hub!! Check out a book from the lists below and get a jump-start on your reading! If all copies are checked out try downloading an e-book version or ask at the Hub desk and we can help you borrow a copy from a partner library. This month, stop by the DIY area to make popsockets! Super easy and fun to make, these are perfect to upgrade your phone for free. 2. Hot glue the two suction cups together (little end to little end). 3. Use the suction cup wide end as a stencil for the decorative paper. Cut out. 4. Glue paper to the wide end of one of the suction cups. My name is Lauren and I am the new Teen Services Advisor. I’m excited to start working in the HUB and even more excited to meet all of you! • I love to eat. Specifically anything with lots and lots of cheese (it is estimated that I have consumed well over 2,000 boxes of Kraft and counting). • When I’m not eating, I’m cooking. Let me know any recipe ideas you have. I am always up for a Food Network-style challenge. • I also love reading, trivia, hanging out with my dog, doing yoga, and watching movies! Come talk to me about your favorite Harry Potter character or tell me about your favorite Youtuber! Looking for a state-of-the-art gaming experience? 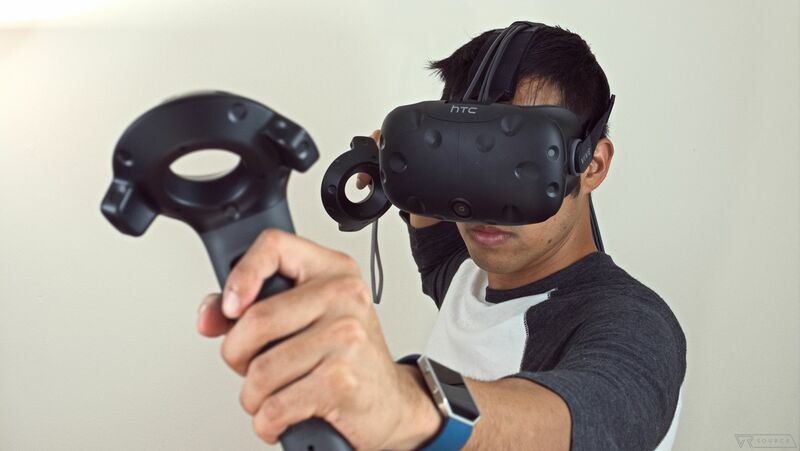 The HTC Vive program is open to all teens. The HTC Vive is a fully immersive, virtual reality headset. And on the following days from 3-4:20 p.m., you can play the HTC Vive in the Hub! Here are some games that you can play! Ryan T. is an intern for the Hub. He is a Senior from Rolling Meadows High School, as part of the District 214 Internship Program. My name is Ryan. For the past four months, I have been an intern for the Hub. Today, I will talk (actually type) about my experiences in District 214's internship program. Before I prattle on, I would like to say that this internship is truly the best first job I could ever have hoped for. In addition, I would without hesitation recommend it any teenager, even if they only go to the library while cramming for finals. No, I am not paid. Yes, I am okay with it. If I had income, the job would lose part of the reason I like it. Since nothing I do at the Hub costs them money, it is less detrimental if I am running late due to traffic. This makes my job less stressful, and it makes a difference in my hefty senior year. A day in the life of a teenage intern is normal until I leave school early to go to work. Then, after signing in, I open the glass door into the Hub. Sometimes I go to tech services as an extra pair of hands. Other times I help set up the HTC Vive in the Hub. The 'cab company' (which shall remain nameless) was the only inconvenience in this rather harmonious situation. They were often late, sometimes on time, and rarely early. This, in turn, caused me to receive less hours than I could have. Despite this, the library was incredibly understanding of the cab issues, and I will return to them in January. In conclusion, the District 214 Internship Program has been a great experience for me. I have enjoyed working at the library because it helped me get a glimpse of working life. I have enjoyed working at the library. Stop by the Hub to craft this month's DIY Kit Emoji Pouch! Too busy to drop in? Here are the instructions so you can make it at home. 1. Lay zipper flat, right side up.Line up one yellow circle and sew small stitches, affixing the zipper to the circle. 2. Sew the other circle onto the other side of the zipper. 3. With the pouch inside out, sew the circles together along the outer edge. *Leave the zipper partially unzipped so you can flip the right side out once done sewing. 4. On the outside of the pouch, use hot glue to attach the heart, eyes, and mouth. Use your pouch to stash earbuds, charger cable, or loose change!